Rhyl Scoops has it licked for traditional Ice Cream Parlour experience! The Rhyl Scoops team tasting their merchandise are, left - right: Louise Ainsworth; Daniel Taylor; Kate Isherwood and Emma Dixon.Are you enjoying the warm weather? If you’re in the vicinity of Rhyl, then drop in for a refreshing ice-cream from ‘Rhyl Scoops’; an ice cream parlour, which will be open for just one week between 23 - 30 June. Rhyl Scoops is hoping to stand out with their clear social enterprise ethos and a commitment to training, but it could also be their lovely pudding flavour ice creams that get them noticed! Along with vanilla, chocolate and strawberry ice cream flavours and a delicious-sounding honeycomb & mint chocolate chip, the Ice Cream Parlour is also offering the traditional British pudding flavours of sticky toffee pudding and lemon meringue. The store is the brainchild of a team of Bangor University psychology students; Daniel Taylor, Emma Dixon, Kate Isherwood and Louise Ainsworth. The team are taking part in a UK competition; Test Town, in which they have to prove that they can set up a viable business in just one week. Test Town is a nationwide competition run by the Carnergie UK Trust that allows young, enterprising individuals to run pop-up shops, and Rhyl is one of the eight towns across the UK chosen to take part. These pop-up shops have the aim to educate the participants but also inspire the population and Rhyl Scoops is one of five teams who will be livening Rhyl town centre during the week, and hoping to turn an idea into a commercial and ethical success. 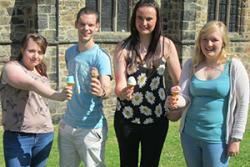 ‘Rhyl Scoops’ will open selling a range of freshly made ice-cream. Behind the Ice Cream Parlour is a goal to create a business that trains their employees with hospitality NVQs, supports other local businesses and is also a social space to relax and reminisce about tales of Rhyl, past and present. "I am incredibly proud of this team. Their passion and creativity seems to know no bounds. They have already taken second place in the national UK Flux business challenge, and have come back with an appetite for more challenges. They work really well together as a team, and I am certain they have a great shot at winning the whole £10k sundae." A winning team from each town will go through to a final round in Cambridge and the chance to win £10,000 towards a business start-up. Bangor University’s team was encouraged and supported by the B-Enterprising team within the Careers and Employability Service at Bangor University, who are committed to encouraging and promoting this type of enterprising activity, with the support of the Welsh Government’s funding for Regional Hubs.